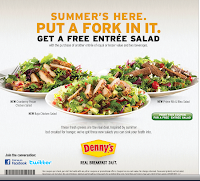 FREE Denny's Salad with purchase of another salad and two drinks. Air Optix Aqua - FREE Trial - Get a free pair of Air Optix Aqua contact lense for a month. Baskin-Robbins will have Scoops for $1.31 on the 31 of the Month. STOP using Protopic!!! I used it very lightly for 5 years on my son. I was never told of a risk and there was no black box warning. And my son had a Burkitt's Lymphoma mass removed in June 2010. STOP USING PROTOPIC!